The vast Groningen gas field in the Netherlands plays an important role in the delivery of both supply and flexibility to the North West European gas market. A 3.4 magnitude quake in August last year has raised serious questions as to the consequences of maintaining current production levels. Any reduction in the volume and flexibility of Groningen production schedules may have important implications for the EU gas market. The vast Groningen gas field in the Netherlands plays an important role in the delivery of both supply and flexibility to the North West European gas market. 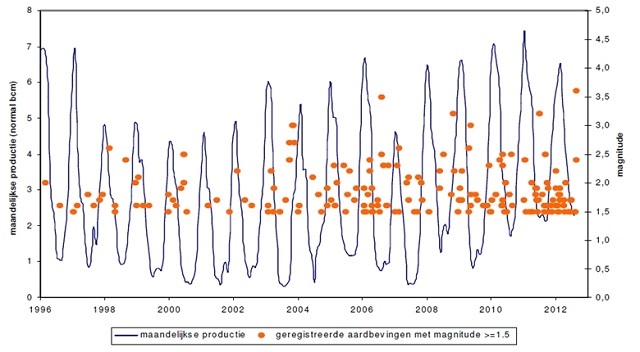 Low level seismic activity has been directly associated with extraction of gas at Groningen for over 15 years. But a 3.4 magnitude quake in August 2012 has raised serious questions as to the consequences of maintaining current production levels. An investigation is underway, focused on (i) the increasing probability of higher magnitude quakes with further field depletion and (ii) the need for reductions in production to mitigate the risks associated with further quakes. Any reduction in the volume and flexibility of Groningen production schedules may have important implications for the EU gas market. The Groningen gas field in the north east of the Netherlands is one of the key production resources around which the European gas market has evolved over the last 50 years. The field was originally discovered in 1959 and commissioned four years later in 1963. On commencement of production, Groningen contained an estimated 2.8 tcm of reserves, enough to supply Germany for over 30 years. To put the size of the field into perspective, it is more than twice the size of the Troll field (the second largest in Europe) and is around the 10th largest field discovered in the world. The Groningen field is also a key provider of seasonal flexibility to the NW European market. 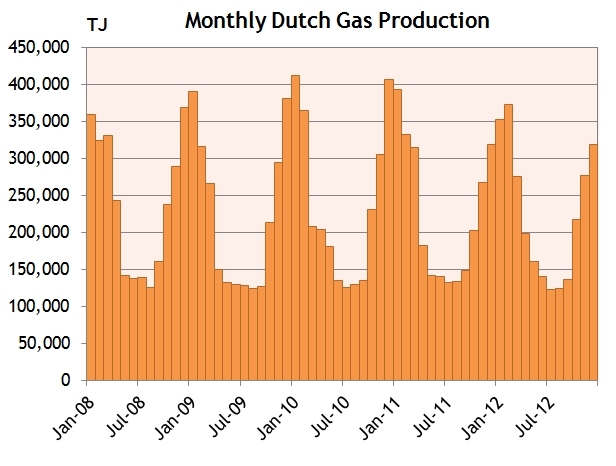 Chart 2 shows the highly seasonal pattern of Dutch gas production, with Groningen providing the significant majority of seasonal shape. Two gas storage facilities, Norg and Grijpskerk, are used to enhance the seasonal flexibility provided by Groningen whilst smoothing the actual production from the field itself. In fact from a regulatory perspective these storage facilities are considered to be additional production facilities. 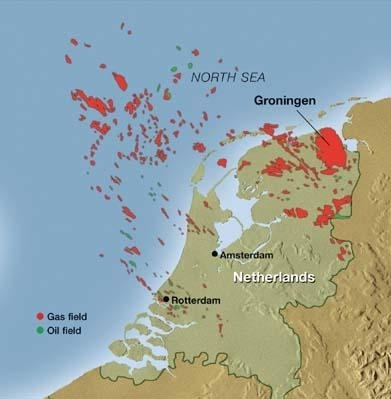 Low level seismic activity has been associated with extraction of gas at Groningen for over 15 years. But on the 16th August last year, an earthquake measuring 3.4 on the Richter scale occurred near Groningen. This was the strongest quake to date and has caused the most associated damage. Whether cuts in production may be required to minimise the risk to infrastructure which is ill equipped to withstand significant tremors. The size and frequency of quakes in relation to production volumes are illustrated in Chart 3. Source: Reassessment of the probability of higher magnitude earthquakes in the Groningen gas field – State Supervision of Mines. The Dutch Government’s response was outlined in a letter by Henk Kamp (the Minister of Economic Affairs) to the Dutch parliament on 25th January 2013. Since 2000, Groningen production has increased from around 20-30 bcm to 45-50 bcm and the number and strength or tremors have increased proportionally. The link between gas production and low level seismic activity is well established, with the KNMI assuming that the maximum magnitude of earthquakes arising from Dutch gas extraction would be 3.9 on the Richter scale. But investigation lead to the conclusion it was now not possible to accurately predict the maximum magnitude from historical data. Based on the evidence of earthquakes in other gas producing basins around the world, KNMI has indicated that the maximum range could be 4-5 on the Richter scale. SodM estimated that there is a 7 per cent change of an earthquake greater than 3.9 occurring in the next twelve months. SodM has advised that gas extraction should be reduced by as much and as quickly and feasibly possible to reduce the number of further earthquakes. The response from the Dutch government has so far been measured, balancing the concerns of local residents against the commercial and economic impacts of reducing production. The Government has tried to provide assurance to local residents that compensation will be available in the event of earthquake damage. They have also endorsed the NAM initiative to provide assistance for the assessment of structural risk and contribute to the cost of any remedial works. NAM has already allocated an additional EUR 100m to support the latter (in addition to existing earthquake compensation schemes). The Government has estimated that an annual 10 bcm (20%) production reduction from the Groningen field would result in reduced taxation of around €2 billion. This gives an indication of the scale of the fiscal and economic impact from any mandated reduction in production. The Government have requested that NAM commission further technical studies to get a more accurate assessment of the potential maximum earthquake magnitude as a function of production. NAM has a deadline of 1 Dec 2013 for submitting a revised production plan which will be assessed by SodM. The government has also requested a review of alternative production techniques that may allow the same rate of production with reduced earthquake risk. Although Groningen is a mature field, it is still a key provider of supply and flexibility into the NW European gas market. From an annual supply/demand balance perspective, the shortfall from say a 10-20 bcm of Groningen production (20%-40%) could be fairly easily met by increased pipeline imports (e.g. from Russia). Meeting this shortfall may however act to tighten the gap between hub and oil-indexed contract prices. Another consideration is that the Groningen field produces low-calorific gas (used extensively in central heating boilers and domestic cooking). There are limitations around processing capacity to convert hi-cal to low-cal gas (through the addition of nitrogen) which means it is not necessarily straightforward to backfill any lost production from Groningen with hi-cal imports. This increases the possibility of a two tiered gas market for hi and low-cal gas (even if only on a temporary basis while conversion capacity is added). If this observation holds up under closer inspection, it raises the possibility of a greater impact of restrictions on peak production. This is likely to reduce the ability of Groningen to supply seasonal flexibility, although it is unclear how such restrictions would apply (particularly in the context of the Norg and Grijpskerk gas storage facilities). Until further investigations are completed, uncertainty around the scale and impact of Groningen production restrictions will remain. But if restrictions are imposed that significantly reduce the ability of Groningen to supply seasonal flexibility, this should support summer/winter price spreads. In the current environment of low returns for flexibility, this may be a rare piece of good news for owners of gas storage assets.